Review by Will Gardner on 11/20/2012. Review by inquisitor on 9/11/2015. Nice small map but suffers from big imbalance issues. 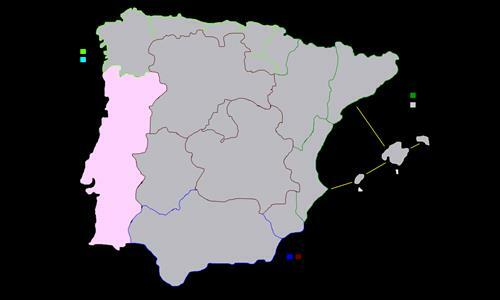 For example South has 2 territories while Madrid 1. It is much easier to guard Madrid but both are worth 1 point only. Review by [NL] sir jo on 12/2/2012. it is small and if you play with lot of people it's funny!!! Review by Raul Calvo Serrano on 12/2/2012. I suppose you are spanish. está bien, pero creo que es un poco pequeño. en lugar de las comunidades, con provincias seria mucho mas divertido, así como con las canarias ceuta y melilla. Buen trabajo. Review by maple on 6/24/2015. Review by Cap'tain America on 5/29/2017. This was good enough for a quick game! Review by Lightning on 2/5/2019.